My hunting season was pretty short this year. I didn't hunt Saturday as I haven't seen many deer with the bountiful acorn crop on the ground. While working around the house on Sunday, I saw five bucks chasing one young doe. I even had a standoff with a young buck with a lot of promise trying to get to my hound dog in my driveway. I decided to go out to see what happened. I had 27 bucks recorded on my cams, a lot of really nice bucks, but two were on my hit list. Two large eights; one three years old and one six. Both of them hang out on the header to a riparian area that eventually joins a creek system. 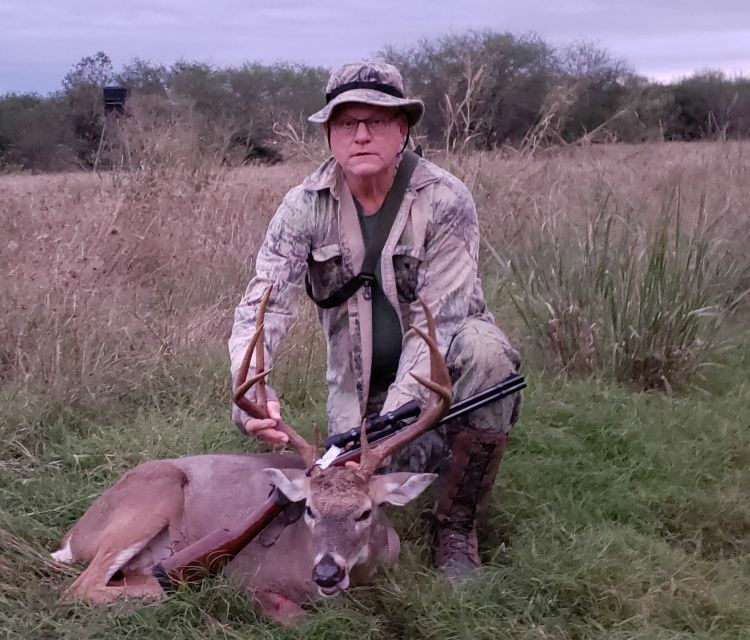 Figuring that they might be hundreds of yards down that drainage, I walked a doe-in-heat drag parallel to the drainage about 250-yards abeam the drainage out in a native grass and brush flat where I could watch that line from a tower blind. The drag-line was about 250-yards in length. The tower sits at the header, so my hope was something good would surface close enough to shoot deer quitting time. It happened about an hour before I expected. I heard something come up behind me and directly under the tower, I'm thinking a large hog. When it got far enough out in front of the blind to see downward, it was the three-year-old. He walked straight to the spot that I left the drag in the high grass as I knew once he saw it, he would spook. The rifle is a 1964 Winchester M94 that dad purchased new, at Gibsons, on a clearance sale for $25. He has killed a bunch of critters with it over the years. He stopped hunting last year and gave me the rifle. I had it rebored and rechambered from 30-30 Win to a 35-30. I also found a period Redfield Jr. Scout mount and did the barrel work for the installation myself. 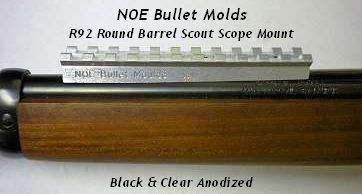 The bullet I'm using is the Speer 180-grain Flat Point. Base on several years, I don't expect the six-year-old eight to make a showing until after Christmas and if it does, I think it would make a grand deer for young fellows first that I have in mind. As far as an eight, it is this deer (I'm sure he is kin) on steroids. The older deer is exceptional. Thats a good size(Big) Buck. I bet that 35-30 put him down fast. Thanks! Yeah, the cartridge & bullet dropped him like a sack of taters. That is one tall and well balanced rack! Did you weigh him? HarryAlonzo wrote: That is one tall and well balanced rack! Did you weigh him? Thanks, 130 lbs on the hoof and 110 field dressed. We have two and a half weeks to Pennsylvania's "buck" season but my excitement just isn't there. There were three shooters at the range yesterday, including me. All three of us confessed to losing our desire about hunting and yet here we were, sighting in. Last edited by Steelbanger on 08 Nov 2018 05, edited 1 time in total. Marlin - a hard habit to break. ... and good morning to you! I hear you. I had a hard time going out to the stand, and I live on my place. I think it was just the weather; it's crappy but not in the winter way. It was 94° yesterday! I did not expect to shoot a buck that I had identified as a possible target. It was over pretty quick. With the weather, I have not seen another deer yet with my day to day activities. I'm leaving for a nilgai scouting trip on Sunday/Monday and then will go back down for the hunt on Thursday night. I'm not very excited about it now, but hopefully, that will change. It is a heck of a journey in and out each day, about two miles back to where I like to set up. I've been walking with a pack frame with 50 lbs on it, the actual stuff I will carry in on Monday; pop up blind, chair, water, and a few other things I will leave back at the site; 50 lbs worth of stuff. It is a little under two miles back to where I have hunted in the past. That's four miles a day. If I kill a nilgai, it will take four trips to get it out, and each of the packs will be 50 to 70 lbs. Not sure about 16 miles with 50 to 70 lbs on the pack frame anymore. I'm in good shape, but that is a load. If I shoot a nilgai as late as noon, given that it will take two hours to prep it on my own, the last two round trips will be in the dark in some very nasty country. Yeah, all of a sudden the trip doesn't carry the interest it once did. Just got an NWS advisory as I was typing the above that the area is going to receive an inch of rain over this weekend. Oh boy, that is going to chase the rattlesnakes up into the trees. I hate that. I'm only a few hundred miles north and it's supposed to snow Monday.